I know several people who have already been to Haru-Ulala in Little Tokyo for their izakaya style small plates, and I was starting to feel left out. So Friday night we made it to Haru-Ulala, which still says Haruki above the door but has recently changed ownership. At 8:00, it was about three quarters full with mostly Japanese families and couples, although I hear it does a big after-work business with Japanese businessmen. As we ate, several parties of non-Japanese turned up, and I was sorry to see that they were all ordering things like firecracker roll and spicy tuna roll. That is not at all what Haru-Ulala is all about -- basically izakaya means pub snacks, which are similar to Japanese tapas. The menu includes skewers of grilled asparagus, eggplant, chicken, etc., and a large selection of interesting grilled, fried and sauteed fish and shellfish. The specials are posted around the walls, so it pays to read everything carefully before ordering. We chose the shortribs with daikon, which were comforting and tender but basically tasted the same as Grandma's pot roast; the fried oysters, which were very nicely fried in panko crumbs; grilled eggplant topped with wonderful little moving fish shavings which made it look like the dish was alive; fried sweet potato, again with panko, not tempura, and our favorite, the squid with shittake. The squid was sliced off a large steak and ultra tender, paired with lightly sauteed shittakes and drowning in butter. Very luxurious. We finished with some green tea noodles in a tasty broth. Sushi is available, but I felt sorry for the motherly sushi lady who nearly rolled her eyes as the orders for California rolls kept rolling in from the white folks. 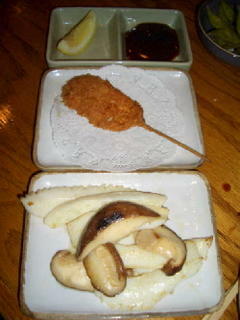 Since these small plates, which run about $3-7 each, are meant as drinking snacks, there's a good sake and beer list. The verdict: With the open grilling stations and lots of seating at the bar, it's a fun place to try lots of different cooked Japanese snacks. 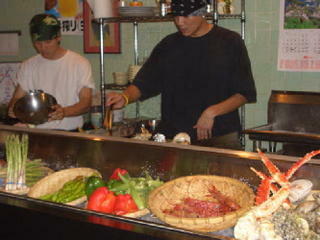 Next time, clams in sake, grilled oysters, yellowtail collar and softshell crab. It can be a little hard to get the server's attention; just keep trying. Our meal was $40 for two large beers and about six dishes.